The historic Patterson Covered Bridge No. 112 is located on Hartman Hollow Road in Columbia County, Pennsylvania in Orange Township. It's 82 feet long by 14 feet wide. It was built in 1875 by builder Frank Derr and listed on the National Register of Historic Places back in 1979. 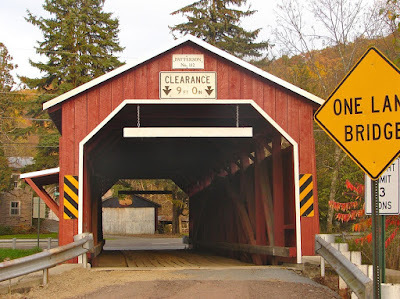 In my honest opinion, its one of the prettiest covered bridges in Columbia County. You can see the Burr Truss Arch Bridge with a tarred metal roof by taking one of the many covered bridge tours in the area and state or you can visit it all on your own. Travelers and locals use the bridge to cross the Green Creek. It was named after the Patterson Saw Mill which was located nearby. Back in 2006 the bridge underwent a major renovation and is currently owned and operated by Columbia County. If you want to photograph this historic site, you'll have to safely pull off to the side of the road. There are no parking lots or official parking spaces nearby. Pennsylvania is known for having many beautiful old covered bridges throughout the entire state. 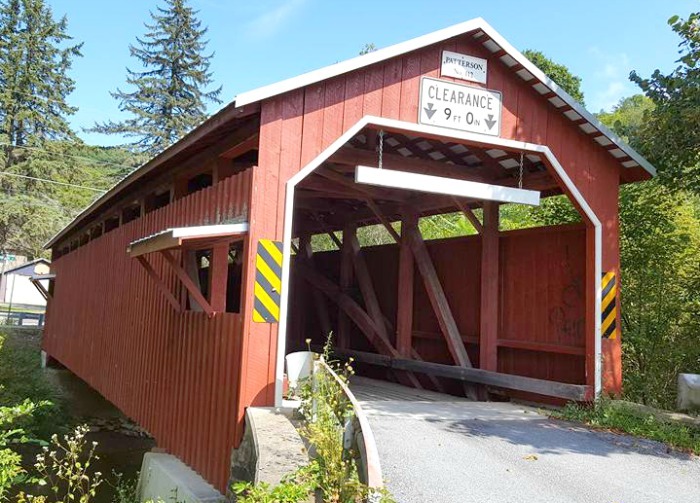 You can find a Pennsylvania Covered Bridge Map online to help guide you to all of the locations where you'll find one. Some of these old historic bridges are closed to the public and on private property, while other's are still open to the public and still in-use by travelers & locals.